Proof $1 American Silver Eagles are the collectible variety of the popular one-ounce silver bullion coin series issued by the United States Mint since 1986. American Silver Eagles are remarkably beautiful coins in proof and are popular with collectors. These coins bear an obverse reprisal of Adolph A. Weinman?s ?Walking Liberty? design first made famous on half dollars struck from 1916 through 1947; on the reverse is a stylized heraldic eagle design on the reverse by John Mercanti. 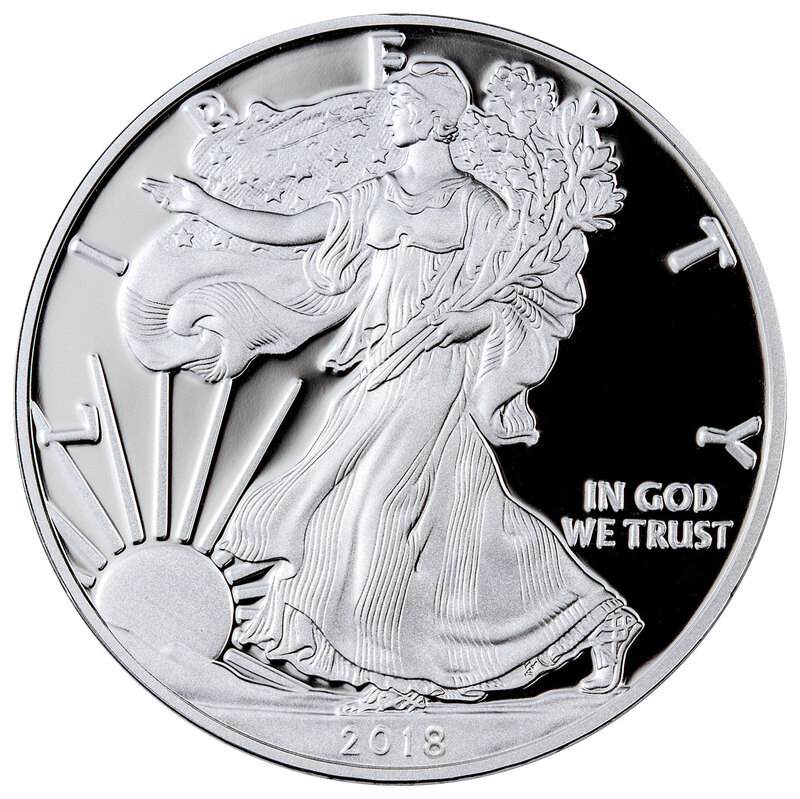 Production of proof American Silver Eagles has been consistent since 1986, with the lone glaring exception of 2009, when a shortage of silver blanks amidst soaring demand for bullion led to a forced hiatus of proof silver eagles. Many proof variants have been struck since 2006, when the first reverse proof was struck and proved quite popular with collectors. Other reverse proofs issued since have also enjoyed great demand, and all reverse proof American Silver Eagles trade for many times over spot value. While many proof American Silver Eagles are hot items in numismatic and bullion circles, the most coveted issue of all is the 1995-W American Silver Eagle. It has a very small mintage of 30,125 pieces and was included as a free bonus item in 1995-W four-piece gold American Eagle proof sets honoring the 10th anniversary of the nation?s bullion coin program. The 1995-W silver eagle now sells for four-figure prices, and for a time PR70 specimens commanded prices of nearly $20,000. As more top-grade specimens have been encapsulated by the major third-party coin certification services, prices for the 1995-W in PR70 have subsequently come down. However, the 1995-W American Silver Eagle is still a wildly popular rarity and, along with other proof silver eagles, is most often sought in PR69 and PR70 grades.